Environmental Health | The S.E.E.P. Malaria is a protozoan that is transmitted to humans through a carrier Anopheles mosquito and is the most important parasitic disease to affect humans (Braunwald, 1998, pg. 1180). According to the World Health Organization’s (WHO) World Malaria Report 2008, there were approximately 247 million cases of malaria in 2006, 86% of them occurring in Africa, and leading to an estimated 881,000 deaths (2008). Malaria rates peaked around 5 million cases per year in the 1930’s (Gates, 2009), and although significant progress has been made in the prevention and treatment of the disease, it is and will continue to be a major battleground for public health efforts. There are four types of malaria that infect humans, Plasmodium vivax, Plasmodium ovale, Plasmodium malariae, and Plasmodium falciparum, with nearly all of the severe cases leading to death being caused by the falciparum subtype (Braunwald, pg.1180). Frighteningly, the WHO estimates that 91% of the malaria cases in 2006 were due to this deadly strain of the disease (World malaria report, 2008). The lifecycle of the parasite is important to understand so that effective interventions can be made to decrease transmission. Humans are an essential part of this cycle, with malarial gametocytes being ingested by a mosquito during a blood meal from an infected human, which then form zygotes that then mature into infective sporozoites that migrate to the insect’s salivary glands. These sporozoites are then injected into another human during another blood meal, starting the next phase of the lifecycle. In human liver cells, the sporozoites develop into schizonts, which produce and release merozoites into the bloodstream. Interestingly, in the ovale and vivax malarial subtypes, some of these organisms become dormant and stay in the liver cells, only to be reactivated sometimes years later with acute infection. Once in the blood, the merozoites invade red blood cells where they further mature into hemoglobin-consuming trophozoites that then make more merozoites that are released when the red blood cell is spent and the cycle continues (Braunwald, pg 1180-81). Active malaria infection causes a variety of symptoms including cyclic fevers, the lysis, or breaking of red blood cells that carry oxygen to the body, splenic enlargement and rupture, cerebral malaria with encephalopathy and coma, hypoglycemia, acidosis, kidney failure, and sometimes death (Braunwald, pg 1182-83). Malaria has been a human health risk for so long, that mutations have arisen to protect certain populations from the disease, the most well-known being sickle-cell trait, where carriers have abnormal hemoglobin leading to early rupture of red blood cells that stops the intravascular reproductive cycle. Glucose-6-phosphatase (G6PD) deficiency is an enzyme deficiency that acts similarly to sickle-cell trait (Braunwald, pg 663). Also, certain populations in endemic malarial areas lack the Duffy blood-group antigen, which is required for P. vivax to infect cells (Braunwald, pg 1180). Although the mutations can be beneficial in preventing severe malaria infections, they can also confer other health problems, since those homozygous for hemoglobin S, the sickle-cell trait, are very sensitive to low oxygenation or stress, lysing red blood cells even without a malarial infection, while those heterozygous for the trait with only one gene are protected from malaria with only minimal other effects (Braunwald, pg 648-50). The approach to intervention and control of malaria has already run the gamut, with governments, non-governmental organizations (NGOs), healthcare professionals and the like, utilizing the clinical intervention model, the public health intervention model, and the environmental stewardship model in attempting to decrease malaria transmission, morbidity and mortality (Moeller, 2005). The clinical intervention model treats those who have already become ill, using chloroquine, mefloquine, or quinine, depending on the subtype and severity of the disease (Harrison’s, pg 1187). Malaria is indeed treatable, but causes worse disease and has increased mortality However, because of the pervasiveness and severity of the disease, the public health intervention model must be used as well to educate those at risk with preventative practices. Environmental stewardship is also paramount in fighting the disease to control the vectors to human disease. There are many approaches to this model in regards to malaria, such as eliminating mosquito breeding areas (Sibbald, 2002) and the use of chemical agents such as DDT or peremptoriness to kill mosquito populations and mosquito larvae. Some of these environmental approaches, such as the use of DDT, have demonstrated significant human health and environmental side effects that may outweigh the risks of the disease. Bill Gates, who’s foundation has become a major player in the global fight against malaria, discussed some of these challenges in his TED talk this February, citing that treated nets plus indoor DDT spraying can cut deaths by over 50% (Gates, 2009). Gates also addresses some of the challenges that we face in that not only can the malaria parasite itself develop resistance to drugs, but the vector mosquitoes also become resistant to insecticide. DDT, or 1,1,1-trichloro-2,2-bis(p-chlorophenyl)ethane, was used extensively as an agricultural and domestic insecticide from the 1930’s to the 1970’s when it was banned in many countries, including the U.S.. It is a type of organochlorine pesticide that has a wide range of effectiveness against mosquitoes as well as many common agricultural insects such as potato beetles, the coddling moth, corn earworm, the cotton bollworm, and tobacco budworms (DDT: An Introduction, N.D.). Because of its broad spectrum effectiveness and low cost, DDT saw wide use around the world beginning after WWII. In the decades following, however, the agricultural application of the chemical caused widespread contamination of water, air, and soil, and was found to persist for decades in the environment (Toxicological Profile, 2002). Similarly to other pesticides, DDT causes significant toxicity with large acute exposures or overdoses, causing neurologic impairment, headache, vomiting, tremors, and other effects (Third National Report, 2005), and after a few decades if use, it was blamed for many environmental phenomena as well. In 1962, Rachel Carson, an environmental activist, wrote Silent Spring, a book documenting declines in bird populations, the presence of the chemical in fish, livestock, pets, and humans, and an association with cancer (Raloff, 2000). After the publication of the book, public awareness and concern about the dangers of the widespread use of DDT became such that by the mid-1970’s, many countries such as the U.S. and much of Europe, had banned the use of the chemical. The heavy use of DDT over just 40 years led to quantifiable changes in wildlife, as well as pressured insects such as mosquitoes, to begin demonstrating resistance to the chemical (Matambo, et al. 2007). Encouragingly, since the ban, the bird populations affected have rebounded (Glausiusz, 2007). DDT has remained in use in some areas and over the last few years has been in somewhat controversial use once again against mosquitoes in the fight against malaria. Part of the reasoning behind this is the difference in usage, small-area spraying verses spraying entire agricultural areas, as well as an alarming rise in malaria cases in some areas since the ban, attributable to greater difficulty controlling mosquito populations without DDT (DDT: An Introduction, N.D.). Over the decades since DDT was banned, more detailed information has been uncovered about its true effects on environmental and human health. It seems that Carson was correct and even may have underestimated DDT’s effect on bird populations and hormonal influences on fish and amphibians (Raloff, 2000). More research on the carcinogenic effects of the chemical show that the age of those exposed plays a role in risk for cancer, demonstrating an increased risk with exposures at younger ages (Cohn, Wolff, Cirillo, & Sholtz, 2007). Continuing studies of the effects of DDT have also shown that rather than causing a large increase in cancer risk, it has similar estrogen-mimicking effects to many of our present-day chemical exposures such as Bisphenol-A and phthalates, as well as many modern, approved pesticides and fertilizers, increasing the risk of certain types of cancer with long-term and cumulative exposures (Third National Report, 2005). Malaria is one of the most significant preventable and treatable diseases to continue to scourge humankind, so much so that it is one of the only environmental pressures through which we can actually see human evolution at work to protect ourselves against it in the form of sickle cell trait and G6PD deficiencies. Malaria needs to be fought on many fronts: education and prevention, eradicating the vector, the Anopheles mosquito, as well as medically treating the parasite itself once it has infected a human. The more people infected, the more reservoir sources mosquitoes have to continue the lifecycle of malaria, the more mosquitoes, the more chance to infect more humans, and the cycle continues. DDT is, thus far, the most effective chemical agent we have against mosquitoes and has been proven to decrease transmission of malaria when sprayed in homes (Gunasekaran, Sahu, Jambulingam, & Das, 2005), especially in conjunction with other prevention measures. Despite this, DDT has been shown to cause significant environmental damage when used in large quantities for agricultural use, effecting avian and fish populations, pressuring mosquitoes to become resistant, as well as causing human health problems with moderate or high level exposures. Although the decision to ban the use of DDT as an agricultural pesticide in the 1970’s was correct and should be upheld, the reasonable use of DDT to fight malaria continues to be a question of risk verses benefit. At this juncture, the malaria epidemic in certain parts of the world, especially in Africa, does justify the use of DDT for this purpose specifically. However, vigilance must be maintained and continued research is imperative to find more sustainable and less toxic methods to fight the disease, realizing that overuse of any chemical or method, be they pesticide or drug, will pressure these organisms to adapt and become resistant to our efforts. DDT should be nothing more than a bridge to keep the malaria epidemic at bay as we look at improvements in mosquito control methods, through both environmental and chemical means, improvements in treatment of the disease itself, as well as continued efforts towards a vaccine. Braunwald E, et. al., (ed.) (1998). Harrison’s Principles of Internal Medicine, 14th ed. New York, New York: McGraw Hill. Cohn, B., Wolff, M., Cirillo, P., & Sholtz, R. (2007). DDT and breast cancer in young women: New data on the significance of age at exposure. Environmental Health Perspectives, 115(10), 1406–1414. Retrieved on April 2, 2009 from Walden Library Academic Search Premier database. Glausiusz, J. (2007, November). Can a maligned pesticide save lives?. Discover, 28(11), 34-36. Retrieved April 2, 2009, from Academic Search Premier database. Lewis, K. (2008, November 4). DDT stalemate stymies malaria control initiative. CMAJ: Canadian Medical Association Journal, 179(10), 999-1000. Retrieved April 2, 2009, from Academic Search Premier database. Matambo, T., Abdalla, H., Brooke, B., Koekemoer, L., Mnzava, A., Hunt, R., et al. (2007). Insecticide resistance in the malarial mosquito Anopheles arabiensis and association with the kdr mutation. Medical & Veterinary Entomology, 21(1), 97-102. Retrieved April 2, 2009, from Academic Search Premier database. Moeller, D. W. (2005). Environmental Health (third ed.). Cambridge, MA: Harvard University Press. Raloff, J. (2000, July). The Case for DDT. Science News, 158(1), 12. Retrieved April 2, 2009, from Academic Search Premier database. Salazar-García, F., Gallardo-Díaz, E., Cerón-Mireles, P., & Borja-Aburto, V. (2004). Reproductive Effects of Occupational DDT Exposure among Male Malaria Control Workers, Environmental Health Perspectives, 112 (5), 542-547. Sibbald, B. (2002). DDT use finally eliminated in North America. CMAJ: Canadian Medical Association Journal, 166(10), 1322. Retrieved April 2, 2009, from Academic Search Premier database. A Brief Essay on The History and Dangers of Trans Fats. Rather than an infectious or outright chemical additive to food, our industrial food process has developed many ways to modify what we eat into other forms with occasionally unanticipated and disastrous results. The introduction of chemically modified trans-fats, formerly known as “partiallly hydrogenated” fats, into our diets over the course of the 20th century is one example of industrial food manipulation gone wrong. Vegetable oil comes in many natural and unnatural forms, the four main types in our diet being saturated fat, monounsaturated fat, polyunsaturated fat, and trans fats, all of which affect the body slightly differently (Fats 101, 2009). Saturated fats and trans fats are considered the “bad fats”, which have been found to increase Low Density Lipoproteins (LDLs), or “bad cholesterol”, when consumed regularly (de Roos, Bots, Katan, 2001), saturated fats also being more calorically dense than unsaturated fats. Since 1990, however, many studies have shown that the artificially modified trans fats have many more deleterious health effects, significantly contributing to vascular and coronary artery disease in various ways (Mozaffarian, Katan, Ascherio, Stampfer, Willett, 2006). Partially hydrogenated oils were first introduced to the American Public in the form of Crisco in 1911 (A History of Trans Fats, 2008). A chemical reaction causes the natural cis, or same-side bond in a fatty acid chain to be converted to a trans, or opposite side bond. 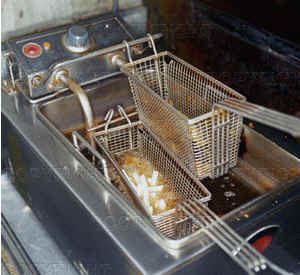 This actually straightens the molecule so that it becomes a more solid substance which allows for longer shelf life, longer use in fryers, and forms solid shortenings and margerine from liquid oil. Since the 1990’s, more and more studies have demonstrated that trans fats have many more health effects than natural fats, even the more caloric saturated fats. An excellent review of the current literature was published in the New England Journal of Medicine in 2006, discussed these many health issues, including elevated LDLs, and triglycerides, decreased High Density Lipoproteins (HDLs), or “good cholesterol”, increased systemic inflammation, and impaired endothelial cell dysfunction, all of which contribute to atherosclerosis, vascular disease, and coronary artery disease (Mozaffarian, et al, 2006). Another study looked at the effects of trans fats on flow-mediated vasodilation (FMD), another risk marker for vascular disease, and found that in comparison with saturated fats, trans fats decreased normal FMD, presumably further increasing cardiac risk (de Roos, et al, 2001). Cardiovascular disease is the number one cause of death in the United States, leading to nearly 8 million heart attacks a year and 6.5 million strokes (Cardiovascular Disease Statistics, 2009). The American Heart Association notes that in 2005, this translates to 864,480 deaths, or 35.3% of U.S. deaths, in comparison to 559,312 deaths from cancer, and 117,809 deaths from accidents. Unfortunately, trans fats have become a part of every American’s diet through margarine, fried foods, trans fats added to foods, it is ubiquitous in our industrial food supply, effecting all of us. As cardiovascular disease has increased over the last century, the addition of trans fats into the American diet has undoubedtly been a factor in the rise of our number one killer. As a testament to the public health system, the healthcare system, and the scientific community, over the last few years, trans fats have become a source of national attention. Through grass-roots activism and public health efforts, trans fats are being discouraged and even outlawed in New York City in 2006 and in California in 2007. More education is needed for consumers to be able to distinguish between types of fats and look for trans fats in labels where they are still available. Volatile Organic Compounds, Why They’re Bad, Why They’re In Your House, and Why FEMA Wasn’t Really at Fault for the Trailer Formaldehyde Debacle. So really, even though FEMA made some mistakes, people getting sick from the formaldehyde levels in the trailers wasn’t their fault. The trailers were actually the fault of the EPA and other regulatory bodies that should have been keeping VOCs out of our building materials in the first place, and a building materials industry that doesn’t always take adequate precautions to protect their consumers. Bottom line – have an idea of what you’re consuming and what’s in it. There are over 85,000 chemicals used in the U.S. in industry and consumer goods, of which we have full toxicologic data for about 7%. That’s a lot we don’t know. Even though we don’t know all of the effects of many of the chemicals we are being exposed to, there is good scientific evidence that some of the more toxic ones and some of the commonly used chemicals cause significant human health problems, even cancer. Exposures are incredibly variable and many of the severe health effects are often accidental or one-time exposures, occupational, or from long-term, chronic exposures, so most people will probably be just fine. However, we’ll see a few thousand people die or get ill from pesticide exposure here, a few hundred thousand cancers from smoking and other carcinogen exposures there, some kids losing 30 or 40 IQ points from lead exposure in homes and toys, male frogs turning into females or having extra legs, little stuff, not really a big deal, right? OR, we could change the way we regulate chemicals to use the precautionary principle and properly test chemicals for human health risks before allowing them to be sold to consumers. Pretty easy way to save lives and an incredible amount of healthcare spending, really. Olgar, S., Oktem, F., Dindar, A., Kilbas, A., Turkoglu, U., Cetin, H., et al. (2008). Volatile solvent abuse caused glomerulopathy and tubulopathy in street children. Human and Experimental Toxicology. 27:477-483. Retrieved on March 12, 2009 from: EBSCO Database, Walden Library. Olson, K. (Ed.). (1999). Poisoning and Drug Overdose. Stamford: Appleton and Lange.